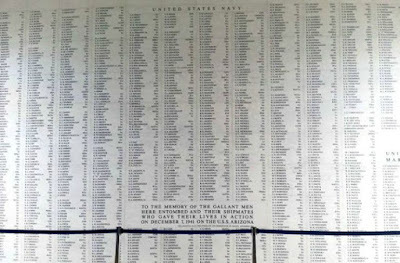 The USS Arizona Memorial is the final resting place for the 1,177 crewmen who lost their lives on December 7th, 1941 in Pearl Harbor, Hawaii. 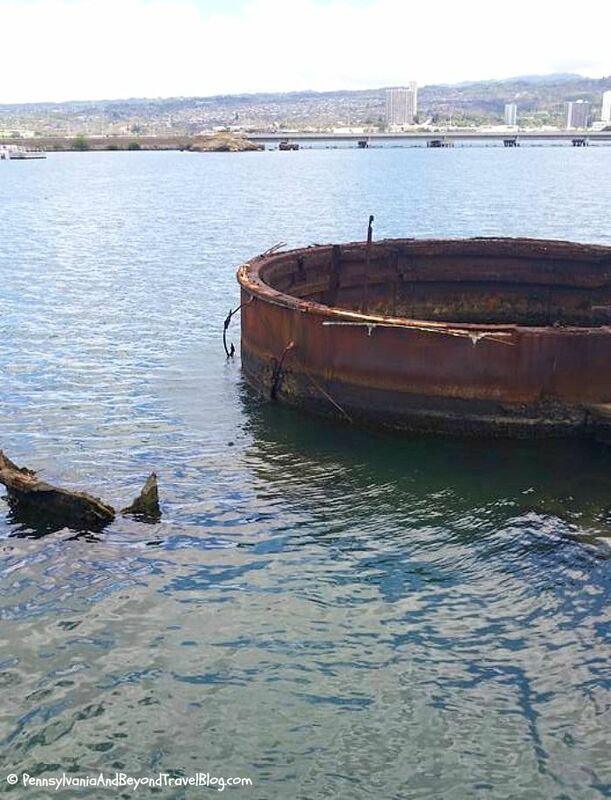 The USS Arizona was the most damaged ship in Battleship Row on that fateful day. 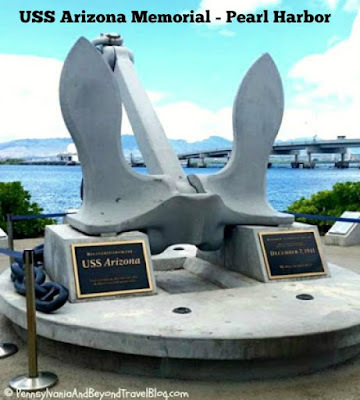 For GPS Users: 1 Arizona Memorial Place in Honolulu, Hawaii 96818. The memorial site is open year-round but closed on Christmas, Thanksgiving and New Year's Day. 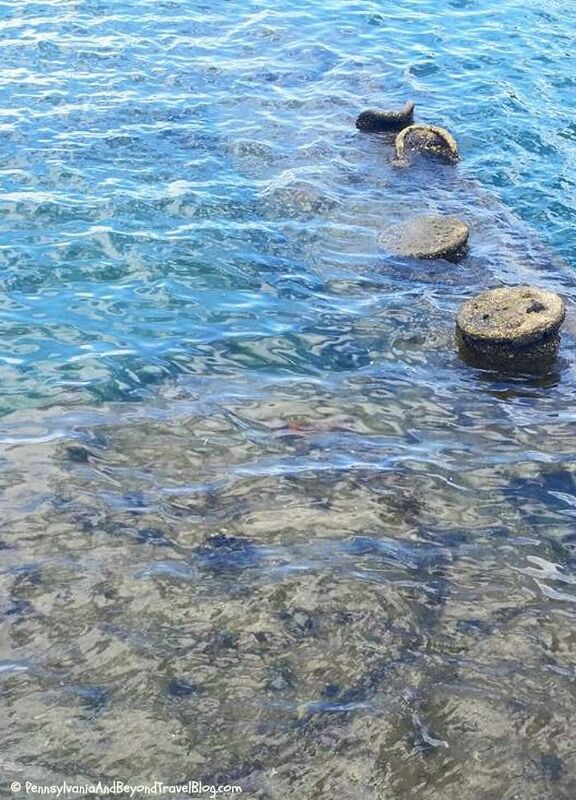 This is a totally 100% free attraction for you to visit in Honolulu. Admission is free and special event tickets are FREE but given out on a first come, first served basis. 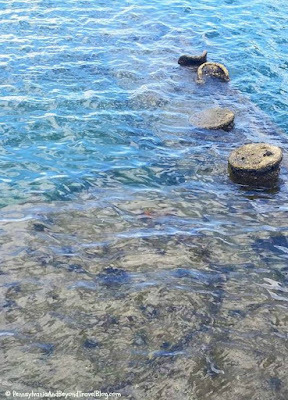 One area of this memorial site that gets a lot of attention by visitors in the USS Arizona Memorial Wall. 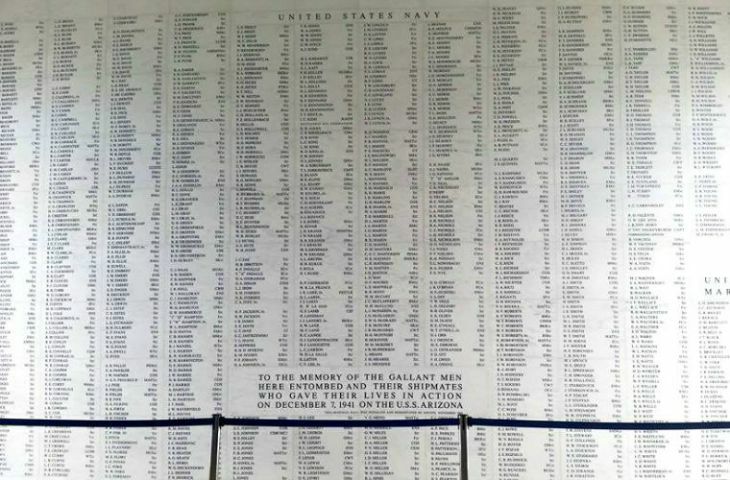 This special wall lists the names of all of the crewmen who lost their lives on that fateful day in December of 1941. It's very humbling to stand in front of that wall and read off the names of those who perished. The 184-foot-long Memorial structure spanning the mid-portion of the sunken battleship consists of three main sections: the entry and assembly rooms; a central area designed for ceremonies and general observation; and the shrine room (shown in the photo above) with the names on the memorial wall. There is a lot to see and take in when visiting this memorial site and I do suggest that you allow at least 2 hours if you fully want to experience it. There are interpretive programs, a short documentary film and tours available...all are free to visitors. 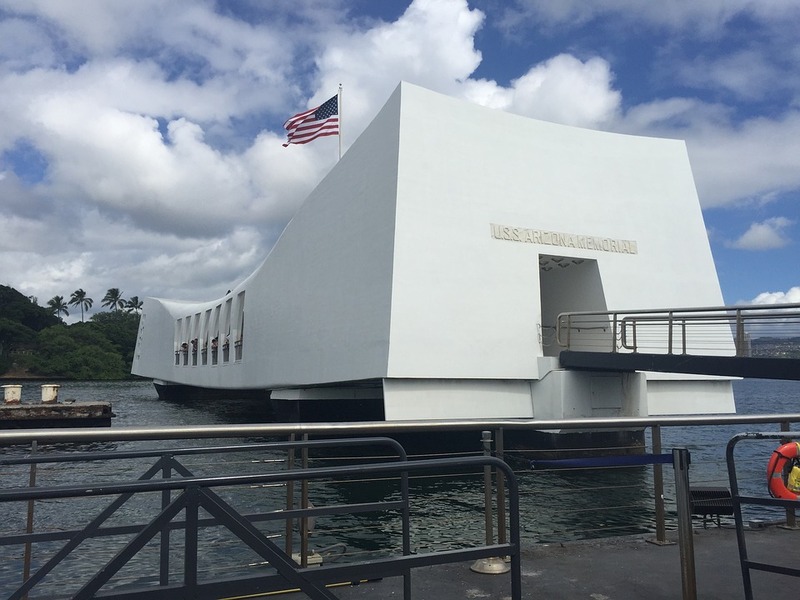 After you are done at the visitor's center you will board a Navy Shuttle Boat which will take you out to the actual memorial itself. You can learn more about Pearl Harbor and the USS Arizona Memorial by visiting their site online. You will find a complete schedule of events, hours of operation and a brief history of the memorial site. This is definitely one place you need to see when visiting Pearl Harbor in Hawaii. Note: You can click on any image in this travel blog post feature. It will automatically open up into a slide show so that all images can be viewed in a larger size. Nice way to see close-up details. I like that a shuttle bus brings you out to the actual site and that there are so many different programs and sights which are interesting yet free for the visitor.